I am currently trying to understand IBL in Unreal Engine, and there are so much things that I don't understand about the formula. Unreal approximate the specular term of shading equation by doing split sum approximation. This is how unreal pre-filter the environment map for specular-irradiance term. My reference on pbr in unreal engine is here and here. I just read notes on moving frostbite to pbr and I found the derivation of the method above. 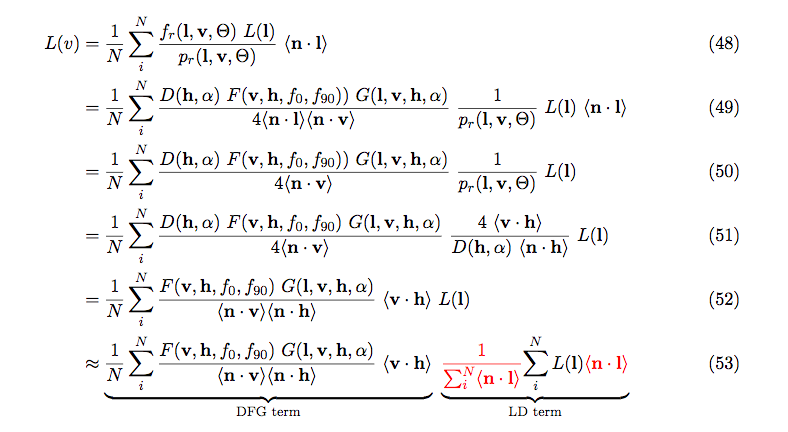 So I will just show the derivation here and quote some of the explanation. One can notice an extra〈n·l〉in the LD term as well as a different weighting 1/(∑Ni〈n·l〉). These empirical terms have been introduce by Karis to allows to improve the reconstructed lighting integral which suffers from coarse hypothesis of separability of this integral. There is no mathematical derivation for these terms, goal was to have an exact match with a constant L(l). So it turns out the pdf is weighted on the DFG term. As for dot(N,l), the term is introduced to minimize the error that is caused by split sum approximation. But I am actually still wondering what is the intuition on that empirical term. Not the answer you're looking for? Browse other questions tagged shader brdf real-time pbr importance-sampling or ask your own question.